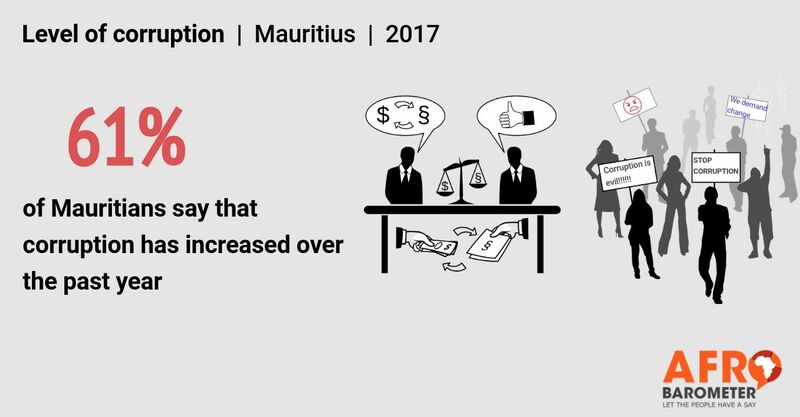 Six in 10 Mauritians (61%) say that corruption has increased over the past year, according to the latest Afrobarometer survey. Overwhelming majorities of Mauritians believe that at least some government officials, police, National Assembly members, local councils, and prime minister staff are involved in corruption. A majority of Mauritians say ordinary citizens risk retaliation if they report corruption. These views reflect public concern about corruption as Transparency International, in its 2016 report, downgraded Mauritius to 50th out of 176 countries in its corruption ranking.